Every dog owner is always concerned about the safety of their pets. Some of them invest heavily in installing wireless electric dog fences around their compounds. In this article, I will highlight the factors one should consider when choosing the best wireless dog fence, how to install them, their benefits and the different types of wireless electric dog fences. When dogs are placed in an enclosed space, it restricts them from running and chasing which all dogs love to do. Dogs don't care about any sort of safety and rend to run around whenever and however they fell which leaves you worrying for their safety. A wireless dog fence is just the right thing you need to keep your dog safe, especially when tour house or property is near a busy road. A large dog running wild can cause serious problems. Choosing the best wireless fence for large dogs is not something you can just decide on without having any idea of how wireless fences work. While other fences (brick and chain) are effective, they are not 100% trusted. They block your view and easily ruin the beautiful look of your house from the outside. Also, large dogs can climb chain fences. Small dogs and large dogs can use wireless fences but aggressive dogs may damage them. The collars of these fences are adjustable to any size you want so it is suitable for any dog size. Owners often get scared of loosing their dogs and worry a little but too much for their safety. These wireless fences ensures maximum safety for your Pets. If you love your dog, you definitely want to get this for them. How do you know the right invisible fence to choose? Large dogs can be hyperactive and dangerous sometimes. You need to contain them away from the rich of kids and the street. Affordability : The cost incurred when installing a wooden fence around a compound is higher than that of a wireless electric fence. It is not labor intensive: When one is installing a wooden fence or an underground electric fence around a yard, aesthetic beauty is usually lost. Deep circular pits may have to be dug to connect electrical cables. However, in using wireless dog fences, all that is required is for one to fix the system, plug it into a socket and to switch it on. A dog's or a dog owner's view is not obstructed: Wireless dog fences are invisible. One's view of the surrounding environment is not blocked. 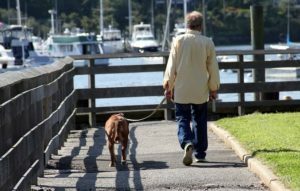 They enable dogs to get familiar with neighbors and frequent passersby. It prevents them from backing on anyone that they see. They can't be damaged: Such fences can't get destroyed by pet onslaughts or harsh weather. There are no small holes made in it which would allow the entry of small animals into the compound. All that one has to do for the fence to last longer is to maintain its battery life properly. They track a dog's location: Traditional wooden fences only allow dogs to get inside a compound. Wireless dog fences enable one to monitor a dog's position and movement inside the compound. It assures the owner of its safety. They have multiple uses: Apart from monitoring a dog's movement, wireless electric fences can also be used to train dogs. This could begin when a puppy is two months old. It can be taught commands such as responding to calls. If one owns more than one dog, they will just need one wireless electric fence system. They can purchase several dog collars depending on the number of their dogs and use the safe, wireless network to contain all dogs within the compound. ** all the ratings are given by our authors based on their experience. Click the above name to check the price on Amazon directly. There is no wireless fence which is perfect for all dogs. Large dogs weigh about 50 pounds, and their necks are usually 18-25 inches wide. The following are the best fences that one can use to contain them. It has a rectangular or square range shape and a circular boundary which keeps dogs inside a yard. The perimeter can be adjusted to 90 feet using an indoor transmitter. Setting it up takes 2hours at most, and it doesn't need wires. Its receiver collar is durable and waterproof. There are five static correction levels which make it ideal for training dogs which weigh more than eight pounds. Multiple dogs can be trained to it at a time. It is a portable fence system which has a circular boundary that keeps dogs in the compound. The boundaries can be adjusted to 90 feet from the transmitter. Its overall adjustable area is a half acre. There is a battery indicator which alerts a person when the charge is low. It can be adjusted according to the dog's neck, and it can be used on several dogs at a time. Petsafe wireless containment system is the best alternative to the normal outdoor fencing you are used to. It is a portable system that keeps your pet within a specific boundary through a radio frequency. It creates an easy alternative to physical fences like chain link, barbed wires or in-ground fences with buried wires. You can keep dogs as large as eight pounds contained in any space you want. All you have to do is plug in the transmitter to a socket and radio frequencies will be emitted to a range of up to 180 ft in diameter. You do not need any wiring knowledge and the complete set up takes just two hours to complete. You and your pet can enjoy the beautiful outdoor view together without having to put on a leash.The transmitter which is located in the center of the specified boundary will send signals to the collar put on the pet. When there is no more signal due to your pet approaching the boundary, the transmitter will send a loud warning which will take him back. If the pet continues to prove stubborn and leaves the boundary, an audible correction will immediately chase him back. That's how the Petsafe wireless containment system works. The system has various disadvantages. -It has a complicated installation process. This is time-consuming, and one still needs to train a dog to get used to it. -It should be sheltered. It is placed in the middle of the compound for safety reasons. -It is not flexible. It must be in the center of a circular boundary making it unsuitable for use in rectangular plots and borders. The system is less efficient on small parcels of land. One is not required to dig and bury wires underground when installing it. Has a clear manual guide. One can choose tone or static. Has five static correction levels. Has a weird round shape. It can be used on dogs weighing less than eight pounds. It is useful in training stubborn dogs, and it has an extra wireless collar receiver. A dog is free to roam when fixed with this collar. Its transmitter can be installed inside the house where it sends wireless signals. This is a portable fence. The collar is light and comfortable to dogs. It fits necks which are up to 28 inches wide and dogs which weigh more than 5 pounds. There are several levels of static correction for training dogs. The good thing about this equipment is that it is lightweight and portable. Also, as mentioned earlier, it can be set up within two hours and can reach an area of 210 feet in diameter. This is mostly recommended for dogs that weigh at least 5 pounds and have a neck size within 6-28 inches. There are five adjustable static correction levels and one of the available modes alerts you with just a single beep. It keeps your dog from always running away. When your dog is about to go beyond the specified radius or boundary, he will get zapped by the boundary line and immediately return. The dog will behave well however you want it to. With this, you don't always have to worry about your dog going over to your neighbor's yard. It can be set up for two days straight without any problem. One of the coolest features is the portability which allows you to take it wherever you want and set it up there. One thing you should keep in mind is that the transmitter may often interfere with some home appliances and disrupt the operation. So it is best to set it up far away from any radio signal emitting appliance. Sometimes the beep in the collar may be very low and inaudible to you or your dog. This is a common problem among many play wireless fences, but you can return it and ask for a better one. It is portable due to its small and light transmitter. Has a bright collar that can be used on small dogs. Has a circular shaped boundary. Signal transmission is caused by metallic objects. It has a collar which can track a dog's location and send a static shock to incase it has passed its boundary. This makes it easy for people to keep dogs in populous urban centers. Its manual contains clear instructions which can be easily understood and there are also useful tips on how to train dogs. It has a smooth installation process as one is not forced to bury wires underground. The customer care representatives are willing to answer numerous questions from clients. Havahart assures each client about their dog's safety. It has an extensive coverage of 11 acres, and it has a waterproof collar which fits dogs whose necks are 14-26 inch wide. The fence system has a boundary breach alert which informs a person when the dog passes its boundary. It enables one to train several dogs at a time since it is possible to adjust each dog's correction levels during training. Dogs should be trained for 10 minutes each day and three times a day for the first three weeks. It helps them get adapted to the fence system quickly. This is one equipment all dog owners would really like. They are completely safe for you and your dog. They offer a certain high level safety to your pet; making you, the owner, feel at ease. They are specially designed to train your dog to understand his space and make him stay within his limits instead of running off into the streets or someone else's yard. Some neighbors may be irritated or allergic to dogs. Some might just be fans of cats and hate dogs. Either way, your dog is safer when he's with you. 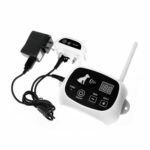 Havahart wireless radial-shape dog electronic fence will put your dog within your desired limits and prevent them from wandering off into unwanted places (which all dogs love to do). Havahart wireless radial-shape dog electronic fence is one of the best wireless dog fences in the world today. This is a new jaw-dropping technology that offers the widest trigger zone, clearest boundary and a very large coverage area any wireless fence could ever offer you. It also has a cool feature that puts the collar into sleep mode when there is no activity done by your dog. The collar is a bit problematic and the customer service from this company is nothing to write home about. Overall, this is an amazing system to keep your dog safe. It has to be away from the road for it to be efficient. Structures block its signal transmittance and reception. It is affected by aluminum and metal surroundings. It has an in-ground containment for dogs which is comfortable and secure. The system enhances proper training to dogs. It has mild corrections that monitor dogs which go beyond the containment system. One can use it on many dogs at a time during wet and dry seasons. The fence can be used in wired and wireless systems. The wireless system contains dogs in a circular area while an in-ground fence can be used for custom shape yards. Its coverage area is broader than that of other fence systems. It has a transmitter that can cover 5 acres in a wired network. Several receiver collars can be used at a time. The collars are waterproof and adjustable. It is difficult for one to set up its shape. The battery has a short power supply period. It can't be installed in small land parcels. 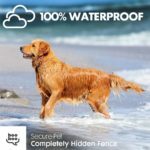 Many years ago, the idea of creating an invisible wireless dog fence would seem crazy, but now we have a WiFi dog fence from Perimeter Technologies. This is a more evolved system than the havahart radial-shaped dog electronic fence. The wireless part is connected to the dog collar with highly integrated chips that constantly gives signals between the station and your dog's collar. Nothing will signify you of your pet's movement but it will still make sure your dog is within the specified boundary. You can purchase it from Amazon.com at less than $350. Lightweight collar made from polycarbonate which makes it durable and long lasting. It also has customized correction for your dogs which adjusts depending in their temperament. Its Wi-fi Collar Transceiver is an advanced model. The fence system uses an in-built battery charger that is located in its Transmitter Smart Station. You should not use it with any metal objects or roofs. An inexperienced dog owner can install it easily. You can customize and tailor boundaries or fences to meet your needs. Funny name but efficient equipment. This is q little bit different from others. It has an auto-train feature, which others don't have. It is somehow sensitive to your dog's behavior and adjust the level of correction. If your dog proves stubborn to the beeping sound, it will also get a vibration warning from the collar, but when he goes out of bounds, there will be an electric zap. The intensity in the zap will keep increasing until the pet turns around and returns out of the boundary line. In case you think your pet will get hurt, don't worry. There is a safety precaution embedded like a safety-shutoff that stops the collar from giving static corrections. Two of the cool features we enjoyed about this system are the waterproof collars and the correction level that is made to suit your pet's temperament. One thing we didn't like is the way the collar goes off even when your dogs is not near the boundary. The invisible fence is wired directly into the ground and as an auto level of correction. It comes with good quality collar which fits smaller dogs as well as big dogs. Also, the collar has a rechargeable lithium battery which can last a week. The Hidden fence is ideal for training dogs. It is safe for pets. Sit fence utilizes an advanced wireless technology. It can cover up to 1.2 acres. Precaution should be taken when using it. This is another great wireless fence dog owners use to keep their pet safe. It has up to 16 adjust the sensitivity easily. The beep and vibration reminds your diga when he is getting out of bounds while the shock serves as a punishment when your dog has gone beyond bounds. The radio signal covers up to 655 yards. You cab also use this to control two dog collars at the same time without staring at the remote. Also, it is rechargeable and water resistant. It can't be easily damaged when your dog decided to roll in a puddle of water. You should rake note that this is boy suitable for aggressive dogs because they can kill their owners a people around them. When the collar is worn for too long or too tight in your pet, it can cause skin damage. The collar should only be on for 12 hours per day in order to prevent irritation on your dog's skin. It is sold at less than $200. The fence system is safe for your dog. It uses a 300mA lithium battery that has long power durability. No extra shipping fees are charged to clients upon purchasing it. Read the user guide if you are a new pet owner. There are various factors which should guide one when selecting the best wireless dog fence. You can also train your dog using the Sportdog Field Trainer SD-425. It will help in making him get accustomed to remaining within your backyard even when he is alone. The field trainer is found in most online stores and it is sold at affordable prices. Using both the manual trainer and installing the best wireless dog fence would be useful in controlling your pet’s movement. Various dog breeds have different personalities and characters. The type of wireless fence selected should be compatible with a dog's temperament. If for instance a dog is energetic and it is being trained as a guard dog, it will be defensive. A high fence should be installed as the dog could be dangerous in case it escapes. Different dogs vary in size. If one owns a small dog such as a Pug, a short fence should be installed. On the other hand, if they own a large dog such as a Labrador, they should fix a high wireless fence. A dog's age is vital when choosing a wireless fence. If it is in its growing stage, the type of fence installed should ensure the dog's safety even after it matures. A high fence should also be used if it's a puppy. Different dogs posses different habits. Some are fond of munching on treats while others appear to be restless. For such restless dogs, a high fence should be used as they can easily escape. Installing a best wireless dog fence is a natural process which takes few hours. The following steps could guide a person on how to do it. Placing the transmitter: This is the most sensitive and time-consuming activity in this process. The antenna should be at the center of the yard but not close to wireless signals such as routers. It should also not be near a lot of metal such as a laundry room or a furnace. They could block or diminish the signal.The transmitter should be on the ground floor. It should be near an outer wall, and it should not be moved since it could interfere with signal transmittance. At first, it should not be attached to any object as one could need to adjust it. Turning on the collar: The collar should be turned on after the transmitter has been placed. Some collar models need to be synced with a secure fence while others don't. These instructions can be obtained from the collar's manual. Setting boundaries: Most wireless electric fences have their radius, high or low settings. Some have a 120-foot radius while others have a 90-foot radius. If one wants to reach the system's full maximum range, she should use the high setting. The scope of the system should be adjusted as per its manual. Setting collars with multiple settings: Sensitive dogs need a low sound setting while aggressive dogs need a high setting. The collar should be set and its setting adjusted according to the manual. Finding the edge: The edge can be determined by using the collar. One should hold an activated collar and walk around in the compound with it until it beeps. He should place a flag there and continue walking within the compound as they put flags after every 5 feet to create a visual boundary. Once this is done, the transmitter should be secured in a place where it can't be knocked or bumped by pets and children. It should be physically mounted to the closet. The collar can then be put on a dog and training can commence. To dog proof a fence, one can use the following options. It is ideal for dogs which like patrolling fence lines. Dense shrubs such as Boxwood can be planted along the fence line. They prevent dogs from jumping high when attempting to escape. Landscaping widens the buffer zone between a dog and the fence. It allows the dog to rest for a while. However, one should regularly inspect the shrubs to check whether the dog has created a tunnel between them. Reed fencing can be applied if a dog reacts to what he sees through a chain link fence. It is a cheap option which increases the aesthetic value of a fence and privacy in a yard. Plastic slats can also be fed through a chain link fence. If one is not bothered when a dog sticks its head through the fence, she can add rolls of garden fencing. If one has a dog which is fond of digging, this option is appropriate. Wires can be laid against the base of the fence while bent at a 90-degree angle. This wire fencing can be buried slightly, or it can be put on the grass and covered by rocks or garden gnomes. They can be used if a dog is addicted to digging. Concrete should be poured along the fence line and be the bottom part of the fence should be sunk into it before it dries up. They are specially designed to prevent jumping dogs from gripping the top part of the fence. They can be enjoined with PVC pipes. It can be done using garden fencing such that the top of the fence is bent and parallel to the ground. They are handy if a yard doesn't have a fence such as a boarding facility or a dog park. Airlocks are built before the main entrance such that is the door is opened, and a dog runs away; they are contained by them outside the door. For some dogs, a sturdy gate is added in front of the porch while for some, a tiny fenced in the area should be built in front of the door with a locking gate. A doorbell can be added to the airlock to make visitors wait outside an airlock before being let in. This option is commonly applied in dog cares. They restrain dogs and allow people to move around. Dogs should not be left unattended in the yard especially if they fight frequently. They can also be attacked by snakes or get bored. Boredom causes dogs to be more adventurous, and they tend to escape regularly. It can be reduced by providing with them playing toys. Most dog owners love their pet to play and run around in the garden. Nobody wants small dogs to take crazy risks. People used high brick fences to contain their pets in the old times. This generated some major drawbacks like the cost of installation, aesthetics and periodic maintenance. These wireless fences have made that problem to be resolved. For most of these systems to work, the dog just wear some sort of electronic collar which usually emits a certain warning. Small dogs are meek and do not damage these collars easily. They are also very playful and active - no wonder they are so cute. It is very important to keep small dogs within a small confinement. Many of these dog collars are completely waterproof which will allow your dog to have fun when it is raining outside. It is also helpful to place some meaningful marks to aid the dog in identifying the limits of his movement. Nevertheless, they are not always well suitable for big aggressive dogs because they can damage the collars or run wild when they start hearing the beeping sound from the collar. These wireless fences are suitable for small dogs. It has a safe containment system and waterproof shock collars which have a receiver, battery, and remote. It can be used to keep dogs within the boundary and in training three dogs. The collar can fit large, medium and small dogs which weigh more than 11 pounds. The system has a rechargeable receiver collar, a transmitter, perimeter radio and a radial-shaped boundary. Each containment system can be used on one dog only. It has a cordless and an easy installation process. It has a maximum setting that can cover more than the 900-foot diameter. The fence system can fit dogs which weigh more than eight pounds and which have 20-inch necks. It is hence suitable for medium, large, extra large and small dogs. It has a waterproof and rechargeable collar. There is a battery indicator which notifies one when to recharge it. The containment system can be attached to many receiver collars hence making it possible for one to train more than one dog at a time. Has a fast product delivery. It has an excellent long, vast range. A waterproof collar which doesn't turn off during rainy seasons. Has a friendly customer service with a refund guarantee of the product. The collar is not adjustable as it could at times be too big or too tight. The manual is hard to understand as it is written in the Chinese language. It is a reliable wireless system which is ideal for small dogs. There is a rechargeable transmitter which has a long charge span hence making it portable. It can be linked to several collars which are rechargeable and waterproof. There is a manual guide with instructions on how to use the collar when training dogs. Customer care representatives are kind and friendly as they are willing to help clients. There is a 100% warranty in case the product is damaged. When choosing the best wireless dog fence to use in your compound, you should consider the dog's size, age, temperament, and character. There are ​different fence systems ​for large and small dogs. I am dog owners, blogger And enlisted personnel at pet training. I love pets so much. I've always had pets. Now In total I have 3 dogs, 1 cat, 1 hamster . I was contributor member of the Dog Writer's Association of America From 2012-2016. I will share my whole experiences on this blog. How Often Should I Brush My Dogs Teeth? What is the Healthiest Food to Feed Your Dog?